Pairing plays to present together takes great care and attention. Why do these pieces go together in this moment in time? Is there something in one that pulls out of the other? The Seeing Place Theater presents Howard Korder’s Boys' Life and Rebecca Gilman's Boy Gets Girl in tandem. Through an opposite gender lens, these plays explore gender roles and norms as stereotypes take center stage. First up is Korder's bromantic comedy Boys' Life. 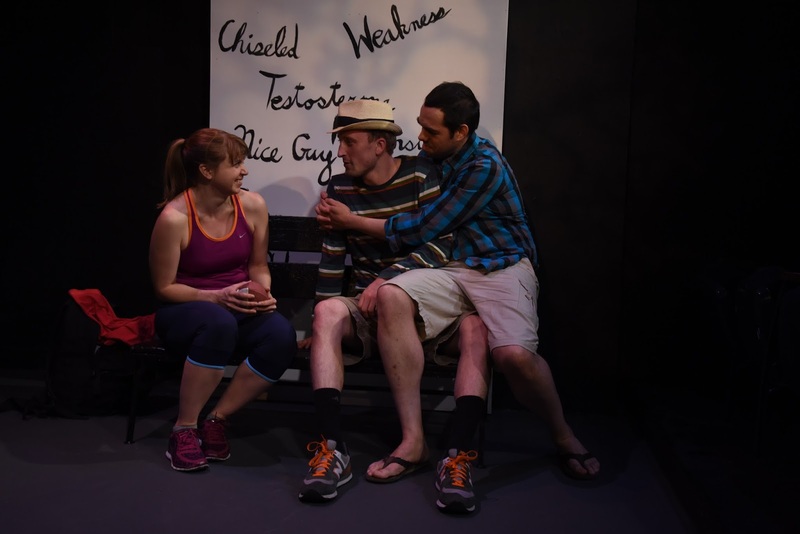 The Pulitzer nominated script of 1988 follows three aging buddies and their personal trials and tribulations of dating and romance. Director Erin Cronican pulls the script into the now yet the references are stuck in the time proving the story and characters are sadly dated. First and foremost, this production questions how Boys' Life could have been nominated for a Pulitzer back in the day. Perhaps it was due to the approach, but the trio of men, with some exception perhaps being Phil, are despicable characters. The women are so strong that you can't understand what in their right mind would make them want to be with these immature boys let alone converse with them. The play depicts the men as vile and unredeemable. Maybe times haven't really changed. On the flip side, Boy Gets Girl is a psychological thriller about a bad date turned stalker drama. The script also falls into the dated trap as the means of stalking nowadays has taken a drastically and terrifyingly cyber turn. Regardless of this and the Lifetime-esque plot, the script, directed by Brandon Walker, keeps you engaged, until things get repetitive. The saga follows Theresa, a writer, who goes on a blind date with a man named Tony who develops a sick obsession with her. Fearing for her safety, Theresa turns to her coworkers and the police for help. It's a tale of strength. Part of the mission of The Seeing Place Theater is presenting theater through “organic staging.” This is fancy for no blocking. It allows the actors to live in the moment and the audience to see something present. The theory of this method proves the dangers, and benefits, of non-concrete decisions in staging. The dangers were evident in Boys’ Life. The pacing of the piece was reminiscent of a very first stumble thru in a rehearsal room. A strong production of this script needs variety to allow the heart to land. That means there should be moments of tender sincerity placed up against fast-paced, hard-hitting comedy. But when the pace is monotonous, the slower scenes come out bland and boring. Sadly, that was the case. The emotional arc of the play was severely lacking. Whether Cronican advised her actors to hit certain spots on the stage was unclear as the in-moment staging was a nightmare. There were entire scenes where actors had their back to an entire side of the audience for an entire scene. The performances by the nine actors were a mixed bag. With the exception of Logan Keeler as Phil, the women outperformed the men. Keeler found a genuine charm in Phil. Of the three best friends, Phil is the most mature for his age. Keeler gave a sincere performance that made him sweet and charming. The other two buddies didn’t quite match Keeler. As boorish Jack, Brandon Walker was almost unwatchable. Walker screamed his way through the play. The character is completely unsatisfactory to begin with, actively pursuing an affair to cheat on his wife, but Walker figured out a way to make him even more unsavory. As Don, Alex Witherow found himself in his underwear and in bed with a different person the majority of the play. When it came to slow momentum, Witherow was the strongest proponent of slowing the play down. When it came to the storytelling of Boys Gets Girl, Walker shined in the director’s seat. While it certainly could have used an act break as two hours plus in a theater is long, the pacing of the thriller was brilliant. The way the mystery unfolded was breathtaking. And that is also partially do to the exquisite performance by Erin Cronican as Theresa. Cronican showed her vulnerability from start to finish, allowing you to want to see her become victorious despite the odds thrown against her. Cronican was dynamic and found a way to not be a victim. Her supporting company did a decent job shaping her journey. As her boss Howard, Einar Gunn offered a balance to the high drama situation. Brandon Walker also took on the role of coworker Mercer. Walker fell into his habits from the previous play, something that didn’t quite fit the character. Though his plotline was quite unnecessary, John D’Arcangelo as Les Kennkat had some wonderful and witty moments with Cronican. Virginia Gregory as Detective Beck made some truly interesting choices. As the detective on Theresa’s case, she needed to be her support but Gregory spent most of her time not engaging with Cronican, making little to no eye contact. It seemed drastically out of character. As far as the actors' movement on stage, everyone seemed to hit the spots with one giant exception where Daniel Michael Perez's Tony not only didn't find his light, he deliberately stayed out of the giant pool of amber. From a production standpoint, both Boys’ Life and Boy Gets Girl utilized generally the same scenic pieces, rearranged differently. What both Cronican and Walker had going against them was the layout of the Clarion Theatre. With seating on two sides and the theater walls creating a zig zag, creating a multi-location set forced everything to be present on all times. Lighting designer Duane Pagano did his best to isolate the space but there was only so much he could do. 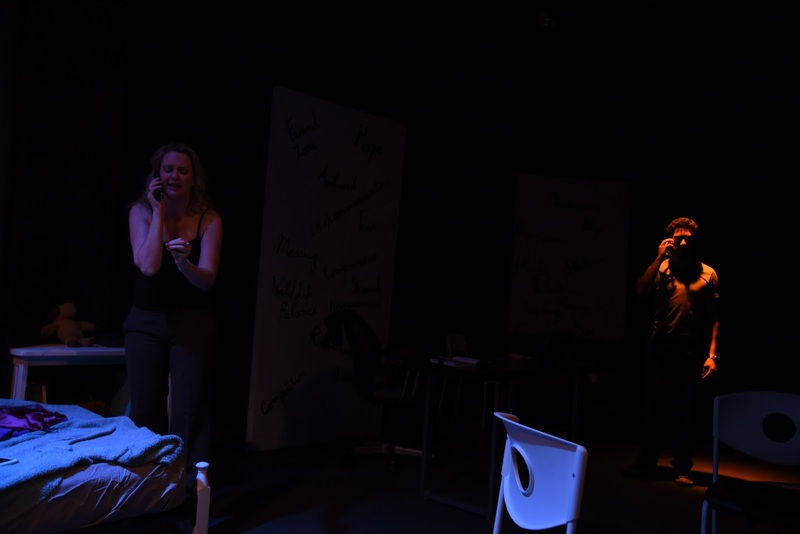 To tie these worlds into the themes of the play, white panels with poorly scripted adjectives were placed in each area. It was a cool touch but the handwriting caused them to look junky. Something that could have aided both productions was a solid sound designer. While the design in Boy Gets Girl wasn’t as noticeable, the sound cues of Boys’ Life were a complete distraction. The levels were far too high, overpowering the scenes. This was ever true in the party scene and the wedding scene. And the wedding song loop kept “Dancing Queen” happen too many times and “Macarena” pull the scene from the moment. As a pair, Boys’ Life and Boy Gets Girl offered both the good and the bad with Boy Gets Girl as the drastically stronger of the two. But regardless of the correlation of the plays, both plays show the dangers of an unstructured production.